Lannae's Food and Travel: Happy New Year 2012! 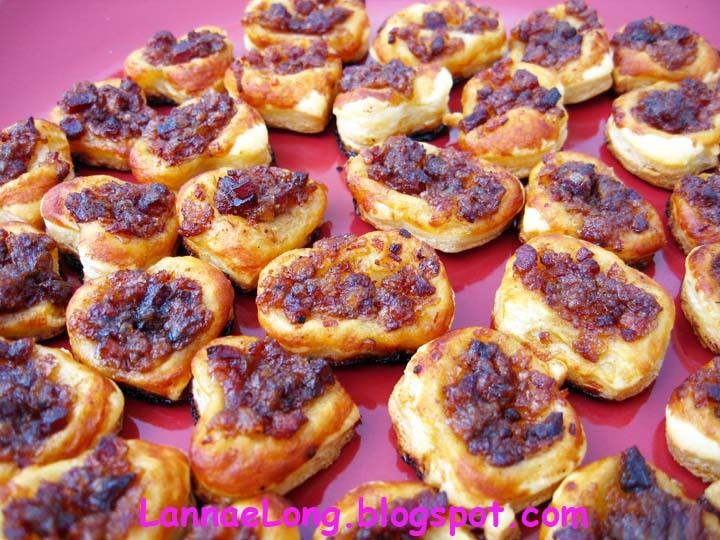 We are invited to a New Year's Day potluck and I decided to make bacon jam puff pastry treats. I got some bacon jam from a pal of mine, and I think this is the recipe for bacon jam. When I run out of bacon jam, I will be making more of it from that recipe. What is not to love about bacon jam, there is maple syrup, bacon and onions, one of the trinity of flavor perfection for salty, sweet and savory. Anyway, as simple as simple can be, I cut out little bite sized puff pastry pieces, and then I topped each with a small dollop of bacon jam. I baked the puff pastry in the oven as directed. The result is a really delicious bite sized treat. Oh these look so delicious! Hope you had a great Christmas and wishing you a wonderfully blessed New Year! !